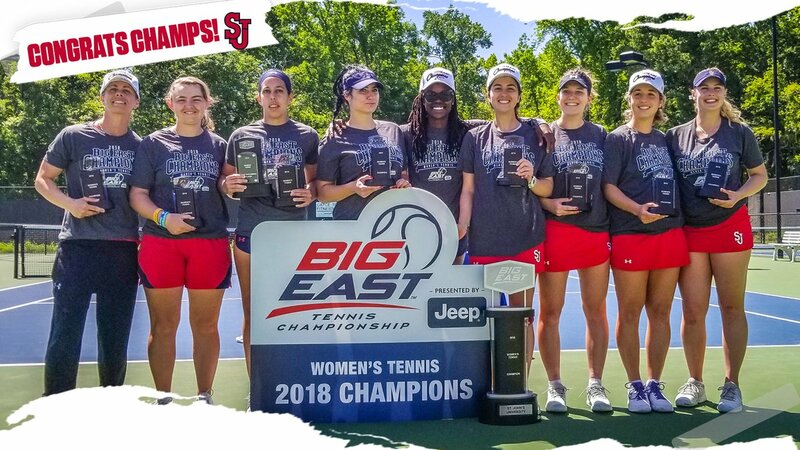 For the first time in program history, the St. John’s women’s tennis team is the winner of the Big East Championships. The Red Storm defeated Depaul 4-2 on Saturday afternoon in Cayce, S.C. to claim its first conference title. St. John’s jumped ahead early as Olaya Inclan Solis and Irina Preotescu won at second doubles, and then Jessica Livianu and Zofia Stanisz won at first doubles to clinch the doubles point for the Red Storm. Kajsa Stegrell would win at sixth singles, and Livianu won her match at first singles to push St. John’s within one victory of the conference championship. The clinching match would come on the second singles court. After winning the opening set, Solis erased a 2-5 second-set deficit to force a tiebreaker, and took it 7-6 to secure her victory and seal the St. John’s win. Solis clinched all three victories over the weekend for the Red Storm, and as a result was named the tournament’s Most Outstanding Player. St. John’s now qualifies for the 2018 NCAA Tournament, and will find out who and where it will be playing during Tuesday night’s selection show. Sign up here for a Free Daily E-Mail with the latest New York Tennis News!